YSC - Chemin de Fer Yverdon - Ste-Croix is a small private railroad in the French speaking part of Switzerland, between the towns of Yverdon-les-Bains and Ste-Croix. 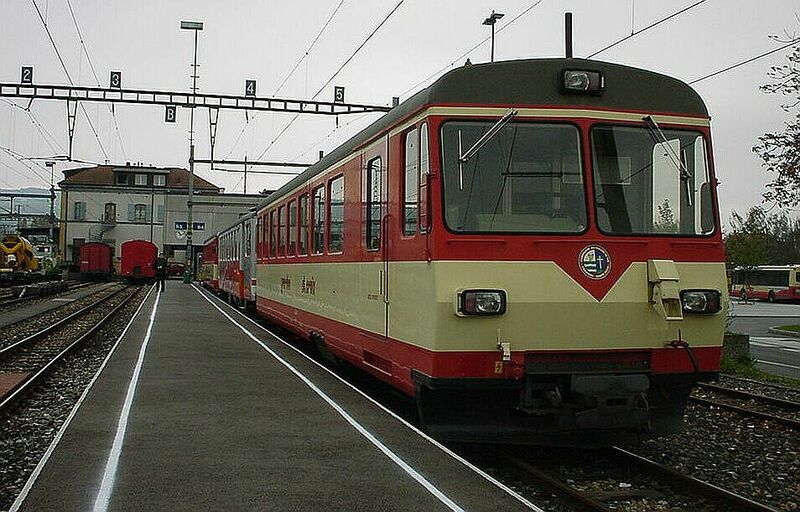 Yverdon lies at the SBB main line between Z�rich and Geneve and Ste-Croix is a small town close by, high up on the Jura mountain hillsides, so this is once again a classic case of Swiss style feeder traffic. The line is only 24 km long. It is a narrow gauge railroad with 1 m gauge width, but it is using the electricity system of "normal trains", 15 kV 16,7 Hz AC. The line was opened for traffic in 1893. YSC has one locomotive, the classic "narrow gauge Crocodile" shown below, two EMU wagons from 1945 and three EMUs from 1981. 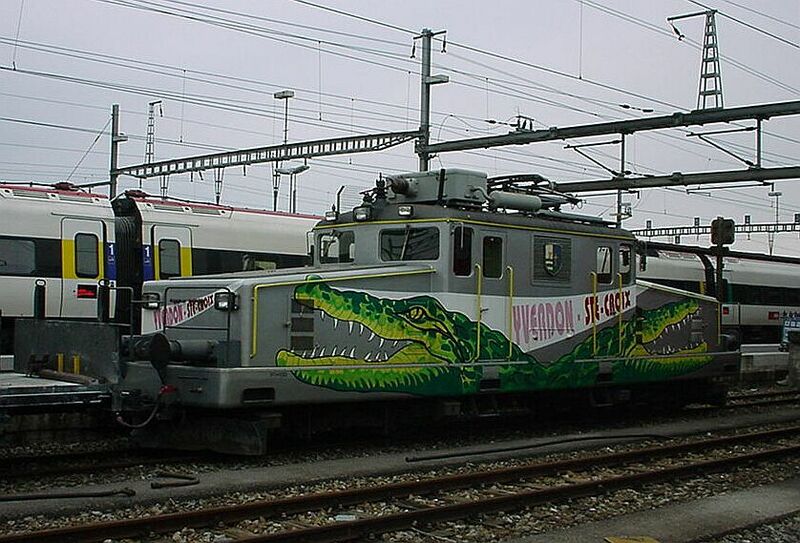 The "Yverdon Krokodil", Ge 4/4 no 21 is built in the same style as the original "Crocodile" locomotives of the 1920s, but this narrow gauge small croc originates from 1950 and actually uses far more modern technology than its predecessors. 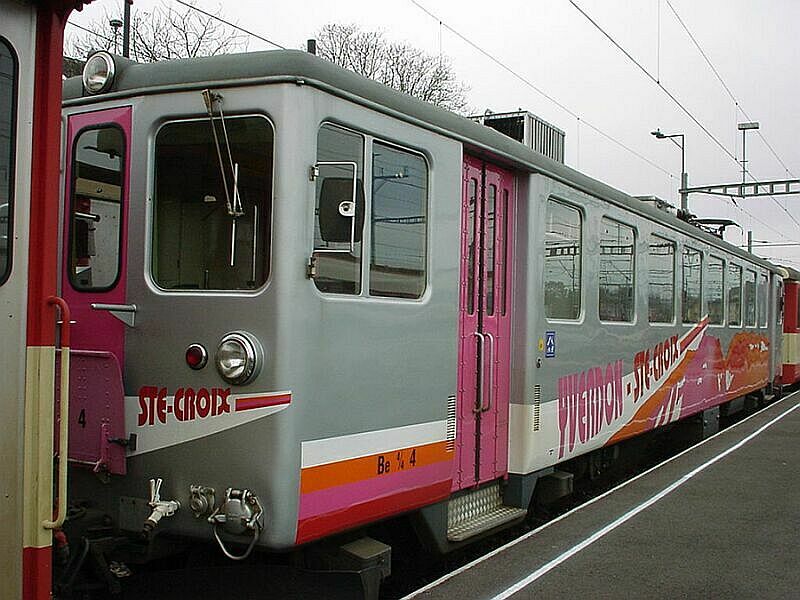 It is the only real locomotive of YSC. The Yverdon Krokodil is only 12,88 m long, but still weighs 41 tons. Its maximum speed is a modest 55 km/h, but in practise even that is a lot on the curvy track along the hillsides. Still in 1996 this locomotive had a fairly stylish 1950s creme and wine red finish, but lately YSC has repainted its trains to look "modern". I doubt whether the new paintings are an improvement ? Another view of the "Yverdon Krokodil" locomotive from 1950. The engine has been recently modernised and looks now completely different from how it has been shown in books (if you have a chance, see for example the excellent small book: K. Hartung: Kleine Typenkunde Schweizer Triebfahrzeuge, Transpress, Germany 1997). Its lamps were small and round and it definitely did not have a modern Einholm aerial. Painting was wine red, with a stripe of cream on the sides: it looked older, yet more "serious" and somehow bigger. Despite its wery short "network" of just 24 km, YSC actually has quite some cargo traffic, believe it or not. When the route was electrified in 1945 it soon turned out that in the post-war situation with not enough cars, the Be 4/4 EMUs could not take enough cargo, so this cargo locomotive was needed in 1950. As shown in a separate picture, the YSC manages to take normal SBB cargo wagons on its narrow gauge rails by means of "extra footware" and this locomotive. This explains the relatively active cargo traffic of for example timber trains. 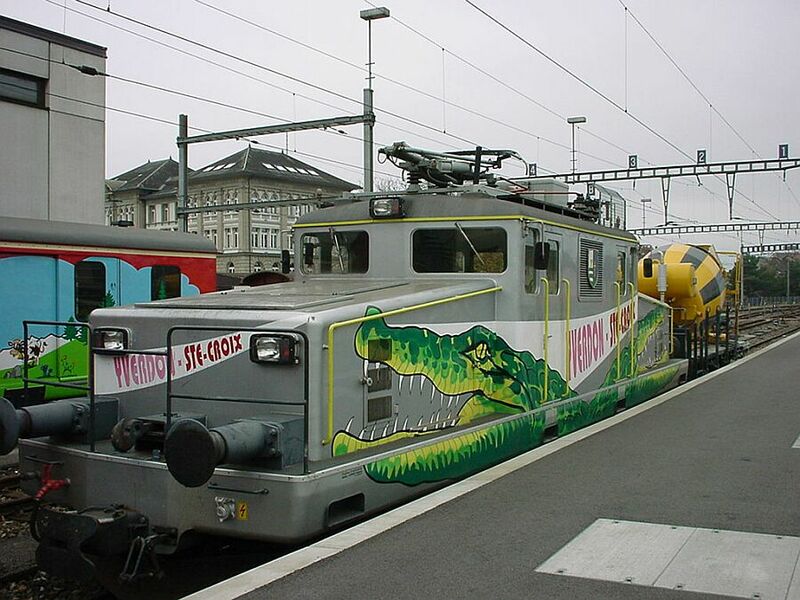 This (and also the picture of the YSC "Yverdon Krokodil" locomotive) show how YSC has been playing with colourings, not quite to the liking of everybody: the original 1980s style colouring has been totally spoilt by the childish graffiti-like painting. Is this good marketing ? This wagon is a small baggage department wagon, which is intended to be added to trains as needed to accommodate bicycles and other bigger baggage items. YSC manages to take "normal" SBB cargo wagons uphill along its narrow gauge route by putting these small "adapters" under the axles of the normal wagons. 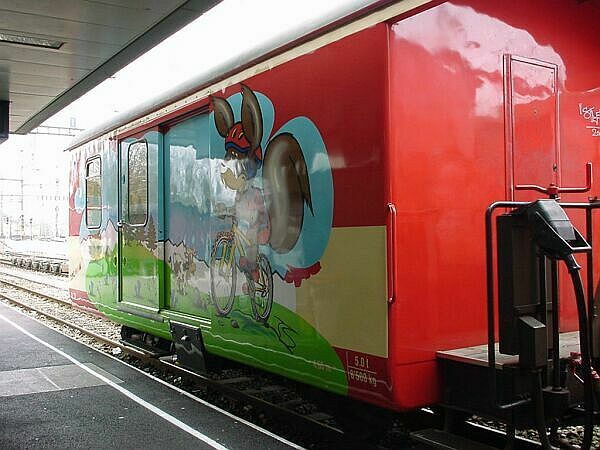 They do the trick of fitting the wagons to only 1 meter gauge width. 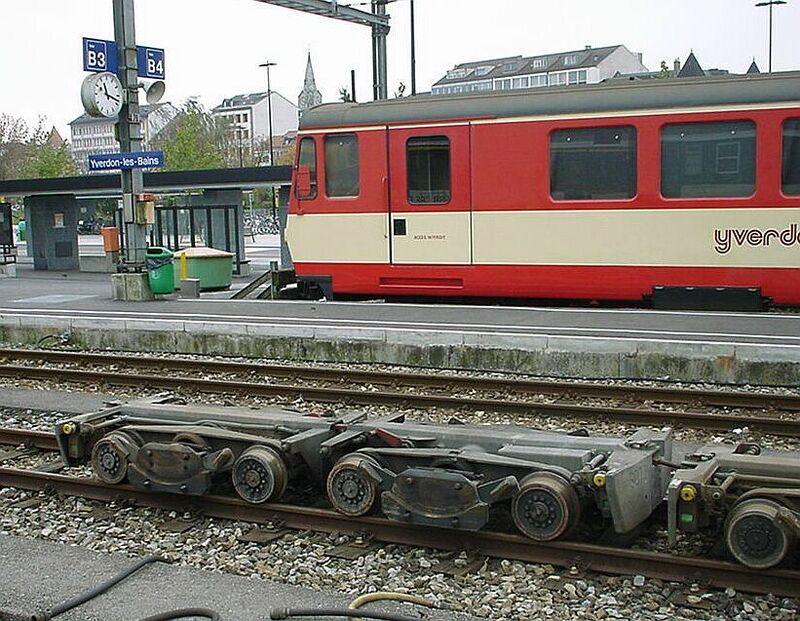 Other narrow gauge networks, for example SBB Br�nigbahn, roll wagons on top of specially designed very flat wagons in order to have wide gauge tracks on the narrow gauge wagons; "train on train".